The company “Strommontazh” confidently holds the leading position in the sphere of the construction of communication objects of any purpose and complexity. Over 45 years of experience on individual projects of reconstruction and building of industrial objects, the last 20 years of which are devoted to the objects of communication, a long list of realized projects and a stable team of professionals give us a possibility to confidently undertake the tasks of any complexity and to solve them without third parties involvements. Any kind of work on communication objects performed by us on the whole territory of Ukraine, all the equipment and professionals are mobile and organized for quick relocation. Network of high-speed Internet access for mass consumers. All kinds of work are done on “turnkey” basis. Customers who we build for can always count on our full participation in future maintenance, upgrade, routine maintenance or emergency work. We conduct all the stages of the work so that operating has no problems, regardless of who will serve the object – our or any other organization. And that is one of the most important indicators of the quality of our work. Base stations for mobile communication operators. 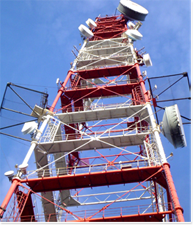 The company “Strommontazh” builds base stations for mobile communication operators on “turnkey” basis. We start working after receiving the specification of work, we conduct preparation and registration of all the permitting documentation – that is the conclusion of the lease contract on the land in favor of a mobile operator, registration of all technical and permitting documents and we complete the entire process with obtaining “Declaration on the readiness of the object to operate” in organs of GASK (Inspection of state architectural – building control). The construction is also carried out by our company from laying the foundation and up to commissioning work, object delivery and entering station into service. Thus, we issue a complete set of documents and provide the full range of design and construction and installation work. Our main customers are the largest mobile operators of Ukraine such as «Kyivstar», «MTS». We have constructed more than 1000 stations in Crimea. All the projects are carried out on “turnkey” basis (with full-fed connections of all the necessary communications and with full registration of documents). Trunk and local fiber-optic communication line (FOCL). “Strommontazh” has gained great experience in the laying of fiber-optic communication lines of trunk purposes and in between the base stations. We are laying the trunk fiber-optic communication lines, assuming the registration of all permitting documents, contracts with the land owners, local government etc. When developing a project we are using the most advanced approaches and conditions of installation, closed or open variants. The technologies of puncture under the roads and various obstacles are available to us. We use the latest technologies of the work conduction which significantly reduce the time and cost of the project. After commissioning of the object, we provide complex services – to perform the maintenance, monitoring, emergency work and upgrades. This is a rather complex objects with a various construction and operation conditions. “Strommontazh” is leading work on the land site selection, preparation and registration of all the design, permitting, technical documents, on the full cycle of the construction and the commissioning along with obtaining all the permitting documents. MSC (Mobile Switching Center – communications switching centers). An example of such work is a communication center for the company “MTS”. Such kinds of orders are rare, exclusive, but the qualification of our specialists in stuff of “Strommontazh” allows us to perform these tasks. Site designed by WebStudio Fine!